NOW THE NATION'S BEST BEACH !, One Of The Best Walking Beaches in the USA, by USA Today International Edition; and “The Best of the Best Sand” by Conde Nast Traveler Magazine. 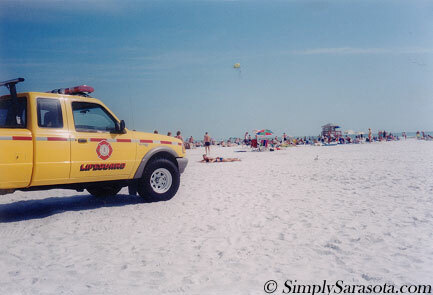 Lifeguards watch over Siesta Key Public Beach all year, and there are tennis, volleyball, softball and food concession facilities provided. Picnic pavilions are available for groups at a nominal fee. Water sports of every kind add color and excitement to the Siesta Beach scene. The 800-car parking lot is frequently full, for this is the most popular beach in Sarasota County. For information on renting picnic shelters and gazebos call (941) 316-1172. At the southern end of Siesta Key is Turtle Beach. The sand here is a bit coarser, but that means the shelling is better. Turtle Beach is also quieter, and although there are no lifeguards or food concessions, families appreciate its comparative solitude and numerous facilities plenty of picnic tables, pavilions with grills, ample parking, and playground equipment. Crescent Beach, usually a little less crowded, has the same fine, white sand. Located just south of Siesta Key Public Beach, it stretches for about one and a half miles toward a place called Point of Rocks, where scuba divers explore the underwater scenery. Palmer Point Beach begins at the southern tip of Siesta Key and continues onto the north end of Casey Key. The northern part of the beach was the former home of Mote Marine Laboratory. Since the closing of Midnight Pass in 1984, the beach allows uninterrupted walking all the way down Casey Key. The beach is a popular spot for boaters and people who walk there from Turtle Beach seeking some privacy. There are no lifeguards and no facilities. Our excellent climate encourages outdoor recreation of all kinds. Whether you want to be an active participant or an avid spectator, you'll find most varieties of sport right here on the key, in Sarasota County, or nearby in the Bay area. The only oil on our beaches is sun tan oil ! Arlington Park. 2650 Waldemere Street. Near Tamiami Trail. Gillespie Park. 710 N. Osprey Avenue. Downtown at Gillespie and N. Osprey. 17th Street Park. 4570 17th Street. East of Beneva Rd & West of Honore Ave.
Woodmere Park. 3951 Woodmere Park Blvd., Venice.